She’s always liked sliced apples with peanut butter or nutella but now she grabs one from the bowl and munches away without anything to hide the taste. The apple selection here in upstate New York is fabulous ~ rows and rows of different types in the grocery stores. I know very little about apples so I’ve now got a chart I take with me. FG’s favorites are: Cortland, Fuji, Golden Delicious and Granny Smith. Personally, I prefer mangoes, papayas, guavas…almost anything over an apple. In fact, I’ve always thought of apples as a bit tasteless and boring but that’s probably because by the time it’s shipped to Hawaii, the apple has lost its flavor. But after reading an article in the October 2007 issue of Good Housekeeping, I may have to give them another try. 1) They are PACKED with fiber (20 percent of your daily value). They take awhile to eat so your body registers that it’s full before you’re tempted to eat more food. The natural sweetener of an apple enters your body slowly so you get steady blood sugar levels. 2) Researchers from the UK found the children of women who ate the most apples while pregnant were less likely to develop lung problems (wheezing, asthma, etc). 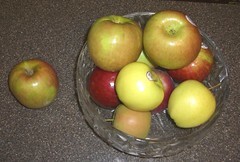 For adults, the reseach suggests apples may lower asthma and lung cancer. 3) The pectin (a type of fiber) and polyphenols (antioxidants) can lower cholesterol levels(especially LDL levels). Important note: eat the skin, it has 2-6 times the antioxidant compounds as the fleshy part. 4) Italian researchers found that eating apples lowered risks for certain cancers such as oral, esophageal, colon, breast, ovarian and prostate. 5) Apples heighten the production of acetylcholine which is a chemical that transmits messages between nerve cells thus keeping your brain sharp as you age. University of Mass in Lowell is doing animal studies on the effects of apples on Alzheimer’s disease. For me, the thought of an apple keeping my brain in good working order is enough to convince me to bite into an apple a day but I think I’ll go with the baked tasty version such as this. I was going to tell you to try honey crisps, but it looks like Rose got to you first. V – I tried the recipe and it was good except I have a hard time coring the apples without going all the way through to the other side. Will have to work on my technique. Rose ~ the Honey Crisp sounds yummy and is on my ‘apple’ chart as excellent for snacks, salads, pies, sauces and freezing. I haven’t been able to find them at my usual grocery store so I may have to pop into a couple of other places and see if they carry them. you really need to try Honey Crisp they are the AWSOME!! I love to make baked apples in the microwave. This recipe is very similar to one that I use. They satisfy my need for sweet perfectly. However, I am not ready for them yet since we are still seeing 90 degree temps down here. Not that I am complaining!